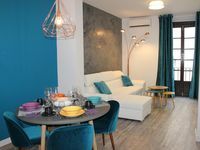 Luxurious apartment in best Triana-Sevilla pedestrian street. Wifi, AC. Property 1: Luxurious apartment in best Triana-Sevilla pedestrian street. Wifi, AC. Flat with 4 bedrooms & 2 bathrooms in Triana. Property 4: Flat with 4 bedrooms & 2 bathrooms in Triana. Cozy and newly renovated apartment next to Triana. Property 7: Cozy and newly renovated apartment next to Triana. 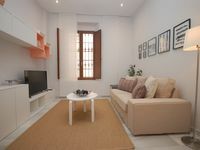 Spacious 3 bedroom apartment in the center of Seville (Triana neighborhood, 1km from the Cathedral). Property 20: Spacious 3 bedroom apartment in the center of Seville (Triana neighborhood, 1km from the Cathedral). Lovely Flat in the Aljarafe Sevillano. Free Parking and pool. Property 24: Lovely Flat in the Aljarafe Sevillano. Free Parking and pool. Duplex with pool (exclusive of the floor) and large terrace in the center of Seville. Property 27: Duplex with pool (exclusive of the floor) and large terrace in the center of Seville. Apartment in pedestrian street Asunción (100m from the Fair and 500 meters from the Plaza de España). Property 32: Apartment in pedestrian street Asunción (100m from the Fair and 500 meters from the Plaza de España). Apt / Private Terrace Together The CATHEDRAL. Property 33: Apt / Private Terrace Together The CATHEDRAL. What a wonderful place to enjoy such a beautiful city. The apartment was clean, nicely decorated and in a quiet location. Thank you for a great stay.